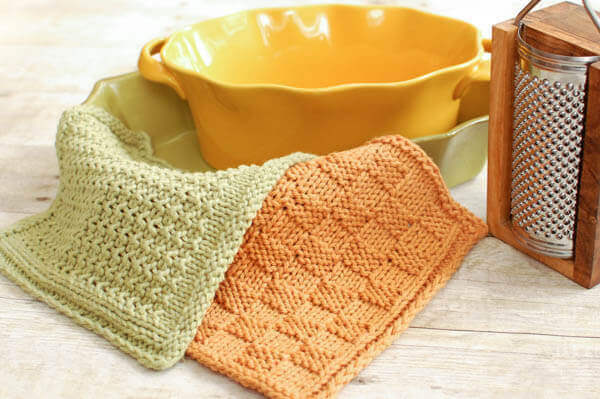 A few weeks back I shared the pattern for my Basket Weave Dishcloth (shown above on right). 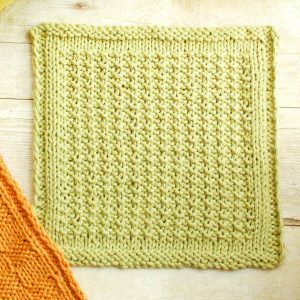 So today I am sharing the pattern for this great Textured Knit Dishcloth. This pretty combo is sure to brighten up your kitchen … they’re great for making as gifts too! Resources and tutorials you may find helpful in following this pattern: Knitting Abbreviations, Complete Beginners Guide to Knitting, Easy Crochet Hook Bind Off. Finished dishcloths measure approximately 8 in. × 8 in. Cast on 37 stitches (I used the long tail cast on method). Row 1: Slip first st purlwise, purl across. Row 2: Slip first st knitwise, knit across. Row 3: Slip first st purlwise, purl 2, knit until 3 sts remain, purl 3. Row 4: Slip first st knitwise, knit 2, purl until 3 sts remain, knit 3. Row 5: Slip first st purlwise, purl 2, knit until 3 sts remain, purl 3. Row 6: Slip first st knitwise, knit 2, purl 2, knit until 5 sts remain, purl 2, knit 3. Row 7: Slip first st purlwise, purl 2, knit 2, *knit 1, purl 1, rep from * across until 6 sts remain, knit 3, purl 3. Rows 8 through 41: Repeat Rows 6 and 7. Row 42: Slip first st knitwise, knit 2, purl until 3 sts remain, knit 3. Row 43: Slip first st purlwise, purl 2, knit until 3 sts remain, purl 3. Row 44: Slip first st knitwise, knit across. Row 45: Slip first st purlwise, purl across. Block to shape if desired ( see How to Block Knit and Crochet Items). I’m New to knitting from patterns. Could you explain what it means to “slip first st purlwise”? I assume “st” means stitch. Thanks! Hi Lisa 🙂 You would but your needle into the stitch as if to purl but instead of purling you just slip the stitch onto the right needle. Hope that helps! I LOVE the texture of this knitting dish cloth! Hi Christine 🙂 The orange one was made with Knit Picks organic cotton, which is unfortunately no longer available. The green once was made with Lion Brand Cotton. Thank you Kara, it’s so sad when yarns colors are no longer available.